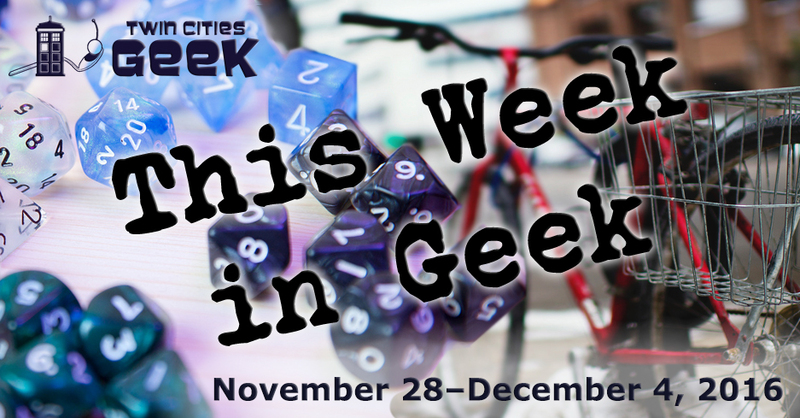 Welcome to This Week in Geek, your guide to events of interest to the Minnesota geek community for the week of Monday, November 28th through Sunday, December 4th. When: Tuesday, November 29th at 6:00 p.m.
Feminist Comic Book Club, an open group for feminists who love comics, will be meeting up to discuss Suicide Club: Kicked in the Teeth. The comic is on sale at Mischief. When: Tuesday, November 29th at 7:00 p.m.
Geek Date Night is hosting a screening of Flight of the Navigator at Clubhouse Jäger. Compete in premovie trivia with Rob Callahan at 7:00 for a chance to win a $50 bar tab, then stay at 9:00 for a screening of the ultimate in ’80s nostalgia sci fi. When: Wednesday, November 30th at 7:00 p.m.
Stay focused and grounded in order to handle holiday stress. This is the third in YogaQuest’s Elf-Care: Self-Care Boot Camp for the Holidays, a six-class series aimed at keeping you healthy during the holidays. When: Thursday, December 1st at 5:00 p.m.
Come and celebrate the new entrance of the Walker Art Center with tours, music, art making, performances, and drinks. There will be a talk by the project’s architects at 6:30 p.m. When: Thursday, December 1st at 7:00 p.m.
Get in the holiday spirit with a rebroadcast in theaters of some of RiffTrax’s favorite holiday classics, including Santa Conquers the Martians and a number of holiday-themed shorts. When: Thursday, September 29th at 7:00 p.m. When: Friday, December 2nd at 8:30 a.m.
Tablets and apps can provide useful bridges for individuals with autism, and this event aims to explore these tools. The Autism Society of Minnesota is presenting a number of workshops for educators, caregivers, parents, and individuals with autism led by Mark Coppin, MS. The workshop costs $75, or $55 for individuals with ASD, and includes lunch. When: Friday, December 2nd at 6:00 p.m. When: Friday, December 2nd at 7:30 p.m.; Saturday, December 3rd at 7:30 p.m.; and Sunday, December 4th at 4:30 p.m. Learn the true meaning of courage and honor as the tale of SQuja’ is retold in the Klingon Christmas Carol. The show runs Friday through Sundays from December 2nd, until December 23d, and features Klingon dialogue with English supertitles. When: Friday, December 2nd at 7:00 p.m.
Come for merrymaking, crafting, and geekery with friends and other geeks as you use a host of provided tools and materials to construct whatever you can dream up in under two and a half hours. Must be 18 years or older, and there is a $25 cover (discounted to $20 per person in groups of 5 or greater). When: Saturday, December 3rd at 10:00 a.m. through December 4th at 5:00 p.m. The Bloomington DoubleTree will be chock full of geeky vendors and holiday cheer on Saturday and Sunday. Expect spaces to hang out with other geeks, snack, and find gifts. When: Saturday, December 3rd from 10:00 a.m. to 10:00 p.m.
Can you pull off a Picard maneuver, or otherwise outwit fellow starship captains and admirals in this monthly organized play event at Fantasy Flight Games Center? Entry fee is $15 spent on Star Trek: Attack Wing merch and/or food and drink. When: Saturday, December 3rd at 4:00 p.m. Celebrate the 10th anniversary of Rock Paper Scissors, the literary journal of Hamline’s MFA program, with past contributors, editors, and designers. A showcase of past work will be followed by light refreshments. When: Saturday, December 3rd at 6:00 p.m. The Minnesota Society of Costumers is putting on its sixth annual Fezziwig’s Steampunk Christmas Carol. See tea dueling, enjoy parlor games, and see a costume contest. This is a 21+ event and is limited to 100 attendees, so get your tickets now! When: Saturday, December 3rd at 6:30 p.m.
Saturday Night Space Opera, a Twin Cities group focused on science-fiction tabletop role-playing games, will be running a one-shot Star Wars RPG using West End Games second-edition rules. The rules are simple, so no prior experience required, and this event is free. See the website or Google Plus page to RSVP.